As a member, there are lots of benefits that you receive. It is fast and easy! Just provide your identification and your card will be issued. Each parlor's loyalty card differs slightly, which can be used only at the issuing parlor. Membership Card is protected by PIN code, which ensures greater security. You can avoid long lines for prize exchange by recording your winning information on your card. Points are saved automatically the next day. 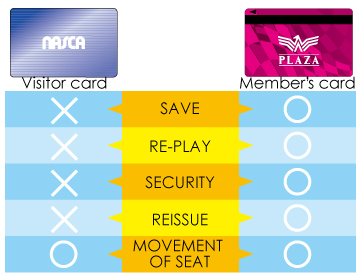 We recommend the use of membership card for customers who plays a game for short time. You can use your saved up points for another game. Snack points can be saved on your card to be used at another time.You can use your saved up snack points to play another game.